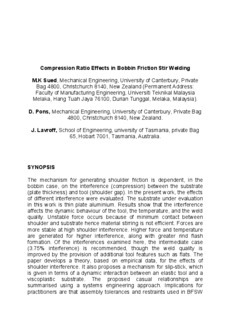 The mechanism for generating shoulder friction is dependent, in the bobbin case, on the interference (compression) between the substrate (plate thickness) and tool (shoulder gap). In the present work, the effects of different interference were evaluated. The substrate under evaluation in this work is thin plate aluminium. Results show that the interference affects the dynamic behaviour of the tool, the temperature, and the weld quality. Unstable force occurs because of minimum contact between shoulder and substrate hence material stirring is not efficient. Forces are more stable at high shoulder interference. Higher force and temperature are generated for higher interference, along with greater rind flash formation. Of the interferences examined here, the intermediate case (3.75% interference) is recommended, though the weld quality is improved by the provision of additional tool features such as flats. The paper develops a theory, based on empirical data, for the effects of shoulder interference. It also proposes a mechanism for slip-stick, which is given in terms of a dynamic interaction between an elastic tool and a viscoplastic substrate. The proposed casual relationships are summarised using a systems engineering approach. Implications for practitioners are that assembly tolerances and restraints used in BFSW need to be such that the parts are firmly held together, otherwise slipstick behaviours result.